It has been one of the wettest winters since records began. Virtually every run I have done has been in the wet and I am well and truly ready for Spring to come. For all of the races I am entered into this year there is mandatory kit that must be carried. Whilst this varies race to race, at its most basic the key elements are an emergency blanket, water and a waterproof top. All of my races this year are in the UK, but I am looking further afield in 2015 and so when I was looking for a new waterproof jacket I was bearing this in mind. However, whilst temperate and moderate, it can be easy to underestimate how quickly and savagely the UK weather can turn especially in the exposed areas where most Ultra races are held. Yesterday was a typical of this. I set out in some light rain and around ten degrees wearing shorts, t-shirt and jacket only. 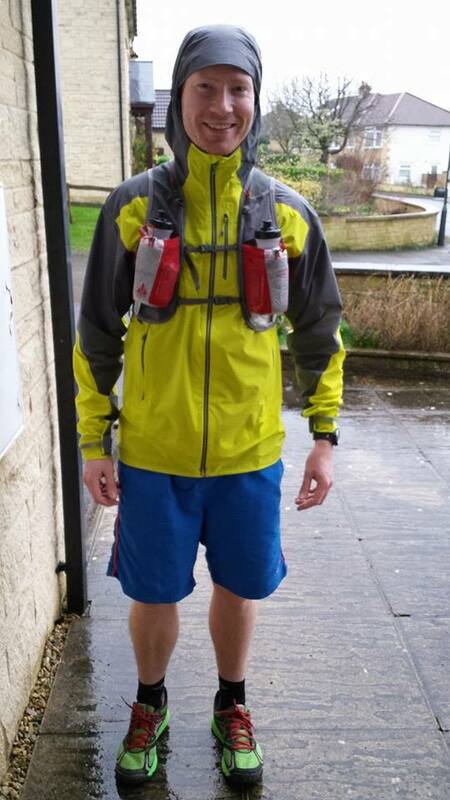 Three hours into my run, I was wearing every item in my race pack- a jumper, hat, buff, gloves and I was sat under my emergency blanket waiting for the weather to calm a little before I could leave the shelter I found on the Cotswold Way. It wasn’t a dangerous situation as I was prepared, but it could have been if I wasn’t. And it was perfect conditions to test out my new waterproof and windproof jacket from Salomon- the Minim 2.5L. There are no shortage of options available, but I was conscious from experience that not all options are equal and if there is one bit of kit that should be invested in, it is a good quality waterproof. With UTMB or CCC in my sites for August 2015, I wanted to make sure that whatever I bought, I would be completely comfortable in these unforgiving environments with it. One of the first options I considered was the Salomon Bonatti which weighs in at just 210 grams and is the jacket of choice recommended by Centurion Running. I then started to explore the Salomon website and drifted into their Hiking section where I came across the new Minim jacket. This weighs in at just 70 grams more, is highly stowable and is designed for appalling conditions being windproof and waterproof. The key selling points were that it contained three pockets, one on the chest and two on the front, as well as zipped vents down both arm sleeves which can be opened when it is not raining to allow air inside and cool your body. Yesterday, my shoes, socks and shorts could not have got any wetter if I had jumped into a river. I was completely saturated, but the Minim jacket somehow kept my upper body totally dry. The only moisture was from my sweat, as it was too wet to open the vents under the sleeves. The hood pulled really tight to ensure nothing dripped in via my neck and for all intents and purposes I was sealed within the jacket. The hood tightens by bungee drawstring, as does the bottom of the jacket with one drawstring on either side. There are also cuff Velcro adjustments to ensure no wind or rain can get in via the sleeves. The waterproof coating ensured water simply slid off the jacket, as it should. With previous jackets in yesterdays sort of weather they would have gradually leaked and taken in moisture so what I noticed most was how light I felt, even towards the end of a six hour run. For me, I would much rather carry the weight of one extra snickers to know that if it comes to it, I am going to be completely safe if the weather turns for the worst. It can be easy to get carried away with focussing on the very lightest and most minimal gear but there are other areas I would rather cut corners than within a jacket. I can see why the elites would carry the absolute bare minimum, but for those of us who get our money’s worth from the entry fee, a little extra will not slow us down. At £180 it is not the cheapest jacket out there. My take on this would be, since September I have run in the wet for probably at least 150 days. For arguments sake, if you had to pay by the run, would you rather pay 50p and come back wet and miserable or £1 per run but come home bone dry and equally importantly, psychologically, know that whatever the weather you can be confident in your kit? Furthermore, being Salomon, you know it has been tested to failure a huge amount before being released for sale and made to the highest standards- so it isn’t just a jacket for one season. If you are in UTMB this coming August or any other race where the weather can get nasty, I would highly recommend the Minim and not just focus on the very lightest jackets out there. This will definitely be in my pack for the South Downs Way 50 in a month’s time. Do you still like the Minim 2.5? 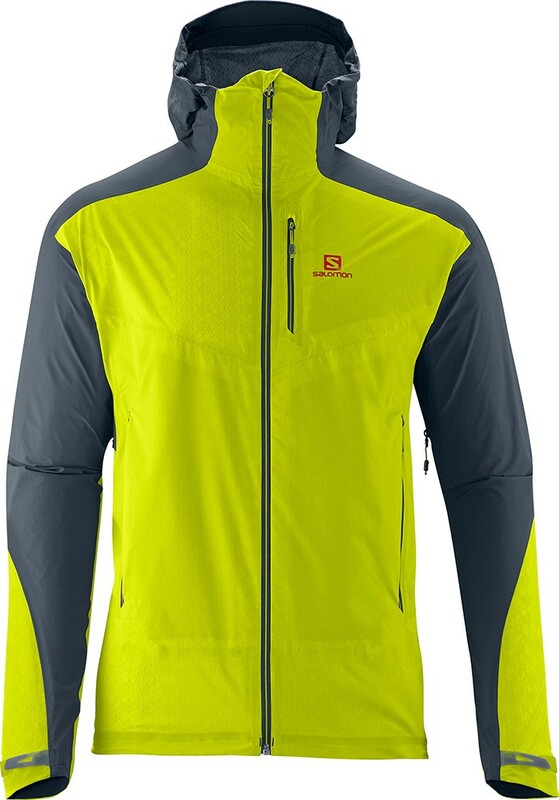 I am looking for a trail running/hiking/biking jacket, does your jacket pack into itself? Still waterproof and breathable? Hi Jonathan- yes, its a great jacket. No issues at all with waterproof/ breathability. I will only use it on days I know it is likely to rain heavily or if light rain predicted I will pack a very thin one as an alternative. Can highly recommend for the activities you mention. How’s the sizing? I’m 5’11” and 11.5 stone. Would you suggest a small or medium? I would go for a medium as a similar build to me. I purchased a Salomon at REI on clearance this past month. I have since found a Mountaineer jacket with a Dry Q breathable membrane online at REI. 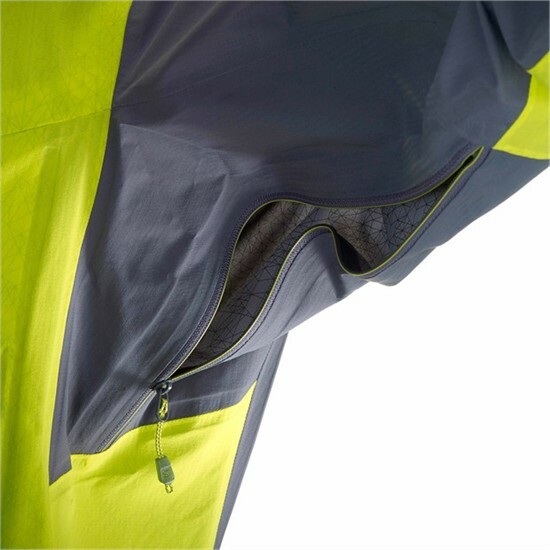 I read the Dry Q fabric was made to compete and as an alternative fabric to the famous GoreTex and that it “pushes the envelope in waterproof and breathability.” Here’s what one site had to say: Dry.Q Elite – Mountain Hardwear’s proprietary W/B fabric developed in conjunction with eVent™. By eliminating the thin continuous PU layer over the PTFE membrane, this technology allows the user to vent water vapor as soon as the garment goes on, without a buildup of moisture and heat. So, I’m wondering if this jacket will eventually help me sweat less and immediately versus the Salomon.